Independence Day 2015 is upon us – do you have your festivities planned out? Pull out your best red, white, and blue and hit the town for these exciting July 4th Events! Though the Myrtle Beach Pelicans won’t be home for the 4th of July they will be playing a three game series against the Salem Wildcats the days leading up to the big weekend so you still have plenty of chances to grab tickets during your Independence Day weekend celebrations. Wednesday will offer $1 hot dogs while Thursday is dollar draft night – making it easy to enjoy time with the family on a budget. Stock up on peanuts and cracker jacks and grab tickets to this summertime favorite! Call (843) 918-6000 for more information. Kick off your Independence Day in style with a scenic race around Myrtle Beach! The annual Independence Day Race begins at 7am and will take participants on a tour of the Market Common area. A 5k and 8k distance are offered for this event and both races will start and end at Valor Park. Call (843) 267-7443 for more information. This unique July 4th commemoration is returning to the Grand Strand for the sixth year and is a great way to enjoy a moment of reflection during your Independence Day celebrations. Vintage aircraft will fly along the South Carolina coast beginning at 1pm at Cherry Grove Beach in North Myrtle. Aircrafts will be visible at various points in the area between 1pm – 2pm and area participants are encouraged to share pictures and videos of the event with the hashtag #SaluteFromTheShore. Exercise your right to enjoy tasty treats this year by participating in the 4th Annual Cupcake Eating Contest at Croissants Bistro & Bakery. This palate pleasing area event will include carnival style games, pony rides, a petting zoo, face painting, balloon animals, live entertainment, cupcake decorating, and the cupcake eating showdown, of course. There will also be plenty of delicious treats available for purchase. Call (843) 448-2253 for more information. Celebrate this Independence Day in “wet n’ wild” style at Myrtle Waves Waterpark. The state’s largest waterpark is pulling out all the stops to make sure families enjoy a July 4th to remember. There will be live character appearances as well as a DJ pumping out popular tunes throughout the afternoon. And, guests who wear a red white, and blue will receive a secret surprise! Call (843) 913-9250 for more information. Gather family and friends and come out to the Surfside Pier area to enjoy free live entertainment between 6pm – 10pm. There will also be family games and food available for purchase. Guests are encouraged to bring beach chairs and / or blankets and settle in for a great evening. The event will conclude with a fireworks display over the ocean at 10pm. Who said parades had to be on land? Experience something new this year at the 32nd Annual Boat Parade in Murrells Inlet. The boats will begin promptly at 10am from the Garden City Pointe and float down past the MarshWalk and down to Morse Landing Park. The best viewing spots are at the MarshWalk, Belin Church, MarshJetty, and Morse Landing. There will also be live entertainment along the MarshWalk later in the evening and a spectacular fireworks show at 10pm. Call (843) 652-4236 for more information. The 4th of July Parade on Pawleys Island is an annual tradition for many visitors and locals alike. Grab a few chairs and kick back as make-shift floats make their way down the island. Old boats, cars, golf carts – anything is fair game! Each float will be decked out in the finest red, white, and blue. This event is fun for the whole family and you won’t want to miss out! This local chain is a favorite among visitors and locals alike and is known for serving up giant, unique concoctions that can’t be found anywhere else. Offerings include the Carolina chili cheeseburger, three alarm fireburger, black-n-bleu burger, nacho crunch burger, and even a peanut butter burger if you are feeling adventurous. There are several locations throughout the Grand Strand. Take a trip back in time and enjoy an old-timey grilled burger at Burkey’s. This diner-style eatery is a local hotspot and serves great eats at a price you can afford. The menu is simple and includes a variety of burger combos with your choice of toppings, including the famous Burkey’s chili. Call (843) 626-2888 for more information. 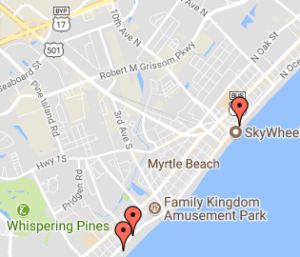 Broadway is centrally located right in the heart of Myrtle Beach and offers several options for anyone seeking a great burger. Popular burger spots at Broadway include Margaritaville, which offers a casual atmosphere and decadent cocktails, Johnny Rockets, which offers a 50’s-style atmosphere that is popular among families, or Hard Rock Café, which has a reputation around the world for a rockin’ good time. Good eats and great oceanfront seats are just what you can expect at this popular restaurant. Indulge in a wide array of southern staples, including prime rib, BBQ sandwiches, and Damon’s own famous ribs. The secret is in the sauce at this BBQ spot and we promise that you won’t leave hungry. Call (843) 626-8000 for more information. This BBQ joint is somewhat of a local gem and it’s not hard to figure out why. Plates include pulled pork or chicken, BBQ sandwiches, and half or whole rack of ribs – not to mention their decadent southern style sides which include mouthwatering favorites like sweet potato casserole, hush puppies, home-style mac and cheese, and much more. Little Pigs is also a great option for bulk / to-go barbecue orders. Call (843) 808-0283 for more information. If a buffet style experience is more your style, be sure to check out Simply Southern Smokehouse. A newcomer to the BBQ scene, this restaurant is quickly making a name for itself. The generous offerings vary but often include pulled pork with sauces, fried and grilled BBQ chicken, chicken bog, mac and cheese, baked beans, collard greens, sweet potato casserole, green beans, and several southern desserts. Call (843) 839-1913 for more information. This downtown staple is hard to miss! And, with over 75 years of history, it’s not hard to see why so many visitors consider a trip to Peaches part of their annual beach tradition. The hotdogs here are one of Peaches signature items. Enjoy a classic foot long with your choice of toppings or opt for one of the more creative signature hotdogs like “the bruiser”, which is beer battered, wrapped in bacon, and topped with chili, cheese, and onions. Call (843)448-7424 for more information. Located in a plaza right off Kings Highway, Sam’s Corner is a great spot to feed the family on the go. Items here are affordably priced and guests can choose to eat in the diner-style setting or take their grub to-go. Choose from a hotdog with your choice of toppings, a traditional foot long dog, or a “State fair dog” – a foot long Italian style sausage, among other things. This hotspot is open 24/7 for your dining convenience. Call (843) 651-3233 for more information. What are you most looking forward to this July 4th? Let us know!